You’ve got your website. You’ve got your email marketing in place — ready to start building your list. It’s now time to take the first steps to getting the word out and the traffic in. You know that customers are finding businesses through their screens. They’re searching for what they need and search engines are responding in kind. So, it makes sense to get your businesses higher in the search rankings, right? Search engine optimization (SEO) is the practice of doing just that. More specifically, it’s optimizing your site to show up for certain searches. It’s also known as organic SEO. You boost your site’s relevance and authority for different search intents. It means your site comes up higher in search results pages. And coming up higher in search results pages means more traffic. Which, of course, is great. But you have a phone repair business. A brick and mortar store. A physical location that customers must visit to employ your services. So, ranking on page 1 for “phone repair” won’t do much if the people searching for it live on different continents. This is where local search marketing comes into play — also known as local SEO. It encompasses all the goodies of organic SEO but throws a geographic component into the mix. 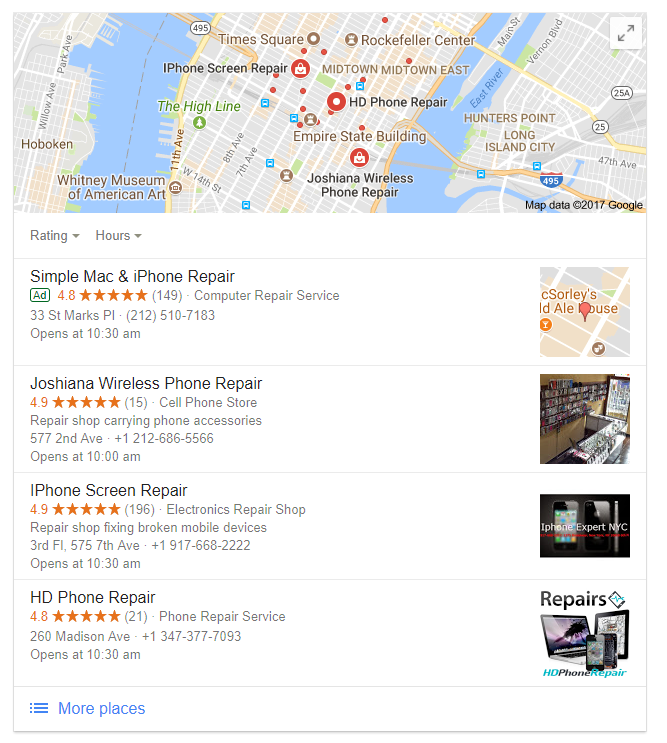 It’s a high search ranking for “iPhone 7 screen repair” versus “iPhone 7 screen repair NYC Midtown”. 72% of consumers who perform local searches end up visiting a store within 5 miles. So if your store is in Midtown and it’s ranking high in local search results? You’ve got a winner. Local SEO is all about the map. Showing up on the map. Outranking others on the map. And being the little red dot people choose when they need their phone fixed. The red dot — on the map. So what does conquering the map do for your business? Local search generally happens when people are looking to solve a problem. When you search for “sushi near me”, nine times out of ten you’re going to end up eating some rice and raw fish. Similarly, if someone is searching for “phone repair near me”, they’re going to get their device fixed. If not, at least inquire about pricing. Optimizing for local search means customers are finding you when they need you. It means that, in addition to requiring your services, they are also — very close by. What else could you want in a potential customer? Your business listing is right there for everyone to see. It comes with all your business’ relevant details and social proof in the form of reviews. For your potential customers, this stuff is gold. Optimizing your business for local search helps you garner the currency of the web — trust. The point is: local search gets your business on potential customer’s radars. It then affords them every opportunity to learn more about (and buy more from) your business. Before we get into the how, all forms of SEO are a marathon — not a sprint. It’s about getting everything in the right place and then letting the search engine do its thing. So, here’s how to get started optimizing your phone repair business for local SEO. Remember when we were talking about credibility? And remember how you saw that search results page? And then remember how there were those business listings with their details and such? Yes to all three? Wonderful. That’s your Google Business listing, and if you haven’t gathered by now — it’s important. So head on over and either claim or create your business listing by signing up or signing in. Consistency — search engines aggregate your business information from many sources. To build reliability in that data it must be consistent. So the name, address and phone number of your business should be the same regardless of what page it’s on. Exactly the same. So if you decide to write your address as 101 Main St instead of 101 Main Street — keep it that way. Everywhere. Why? Because again — it builds trust. Would you rather go to a store with a listing that only shows an address? Or one filled with pretty pictures of the actual store and its wonderful employees? Accuracy — this one seems like a no-brainer. But, when filling out your details, be as accurate as possible. So when choosing your business category pick the one closest to your business. Which, in your case, would be in the realm of cell phone store. Like Google, you’ll want to either claim or set up listings on other sites. This is both for those who don’t use Google but also, again, about building credibility and trust. These sites play a major role in your local search rankings. What’s more, sites like Yelp or Facebook often appear higher in the organic search results. Why does this matter to local search marketing? In case a customer decides to scroll past the local listings. You’ll want the pages about your business to have accurate and relevant information. Also, if you have done customer research and are aware of any niche search sites they use, make sure you set up there too. Citations are other sites around the web where you can list your business. Think industry or geographically-specific directories or associations. So with your site already on the major search engines and social media sites — why do you need citations? Because one of Google’s major local ranking factors is prominence. It’s how well-known your business is online and how much information search engines can find about it. The more Google finds about your business = higher prominence = better local search rankings. Use a tool like Moz local which will put your business information on major aggregate sites. They will then distribute it to many smaller citation sites. There are also many smaller free citation sites. Make sure they’re relevant to your business or location. Also, use your common-sense here when signing up. If the page looks archaic or of questionable quality — avoid it like the plague. Search engines use citation data to determine what they display about your business. So, like in your business listings, consistency is key here. You’ll want to prioritize Google My Business and Yelp reviews. Reviews are all about social proof. Odds are, your shop won’t be the only place that repairs phones in a 5-mile radius. Once you’re in the local search rankings — it will be your reviews that give you the competitive advantage. Don’t be above asking your previous customers to provide a review. If they were happy with the service, it shouldn’t be a problem. You’ll want to collect as many as possible. A 4.8-star rating from 50 reviews is better than a 5-star rating from one review. (Especially if that one review is by you). If they’re searching for it… and it’s close by. But that’s what you want. That’s what local search marketing does for your business. Running a brick and mortar store is now less about location, location, location. It’s now more about just being there — online. Being found and then having the digital social proof to build credibility. First, the neighborhood, then the world.